To celebrate Chocolate Week, join us next Wednesday at our Canary Wharf store, for an evening of delicious Godiva and wonderful Port from Ramos Pinto. RSVP is essential. Academy of Chocolate Conference hosted by Simon Parkes, broadcaster and journalist – We’ll be pooling the thoughts of global experts on everything that contributes to the price we pay – or should pay – for chocolate. Topics include cacao as commodity; sustainability and Fairtrade; issues of child labour; cacao genetics, geo traceabilty and just what goes into bean-to-bar production. We’ll consider what the future holds for both industry and consumer: what novel flavours, innovations and trends can we anticipate? And at what price? As ever, there will be an opportunity to meet cacao and chocolate producers, watch master chocolatier demonstrations and, not least, taste sublime chocolate creations. Chocolate Afternoon Party – Death by chocolate, chocolate and caramel shot, dark and white chocolate cupcake to name a few of the cakes we are serving to celebrate Chocolate Week this coming October 2014 by Divine Chocolate. Pudding extremists Gü Puds and Mark Sargeant’s Plum + Spilt Milk have combined their culinary skills to create a three course menu masterclass on cooking with chocolate. This will be a rare opportunity to hear Bertil Akesson, founder of Akesson’s, speak about his experiences as a bean-to-bar chocolate producer and to taste some of his highly-awarded chocolate bar range. K West is a contemporary 4 star hotel in Shepherds Bush, West London. 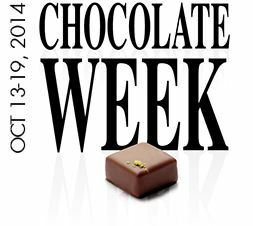 During Chocolate Week they will be offering a Divine dark chocolate and sea salt body scrub, plus a dark chocolate honey balm massage in the subterranean K Spa. The sophisticated cocktail den, K Lounge will also be offering Divine chocolate and chilli martini, plus mini bars in reception throughout the week. The Mayfair Chocolate Tour is the closest route to our Original Chocolate Ecstasy Tour, first offered in 2005. The Chocolate Show London is the grand finale of Chocolate Week. Meet the best chocolatiers and chocolate companies from the UK and around the world. Indulge in their exceptional chocolate creations along with demonstrations by renowned chefs, tastings and hands on workshops. During Chocolate week, which starts on October 13, Rococo is inviting you to taste their very special organic artisan bars. Each day a new flavour will be offered to customers. It will be the same flavour in each Rococo shop – Motcomb Street, Moxon Street, Kings Road and Chester -and there will be a 15% discount on the flavour of the day bar. A perfect way to try something new! These new flavours form part of the amazing new tastes in the “ultimate boxed collection” from Rococo which will be coming soon. Chococo will be celebrating the launch of its new chocolate “Totally Twisted Nose” with a party on Monday 13 October at their Winchester shop – open to all. Chocolate Week menu and competition – Bom Bom Patisserie creates classical Brazilian sweets and desserts for any occasion. During Chocolate week they will be creating special gluten and dairy free recipes so chocolate can be enjoyed by everyone! They will also be handing out mini bars of Divine to all customers as well as giving away hampers via Facebook and Twitter. Especially for Chocolate Week we’re making our own Chocolate Week Chocolate Bar, follow our progress throughout the week at 5.30pm daily as we share our journey on the adventure with our visitors. Chococo in Swanage, Dorset will kick-start Chocolate Week on Monday 13th October with the launch of their latest fresh chocolate, the Totally Twisted Nose. Encouraging everyone to “try something new”, you can discover their NEW hot chocolate and Tablet (Scottish-style fudge) flavour, as well as different samples of their fine chocolate throughout the week. The week will end with a special chocolate tea party on Sunday 19th October. For the tenth annual Screen Bites Film and Food Festival, Claire Burnet, Chococo Co-founder, is hosting a chocolate-themed evening in Durweston, Dorset on Friday 17th October. We’re getting into the spirit of this year’s National Chocolate Week with special sweet and savoury chocolate-themed dishes on our menu in Gilroy’s Dining Room and Dickens Bistro from October 13th to 16th. The Chesil Rectory is proud to be celebrating Chocolate Week 2014 with Chococo & invites you to enjoy an exclusive chocolate-inspired evening at our historic, unique restaurant . The award- winning artisan chocolatier Chococo, renowned for creating truly fresh fine handmade chocolates, is collaborating with Twisted Nose Gin and The Watercress Company, to launch its new Hampshire flavours-inspired chocolate. Chococo is supplying origin couvertures for The Chesil Rectory’s Chocolate Week 2014 chocolate inspired tasting menu.